Right. That’s it. I’m over this situation. Miracle cure, now. please. I so, so, so feel for those whose health is way worse than mine, because this is bad enough. This week has been my second week on the medication that is hoped to pull my over-active, uninvited, toxic thyroid nodules into line and by yesterday I was, indeed, starting to feel better. In fact I even felt like dancing in the local supermarket this morning. Not that I did mind you. That would have looked silly, dancing with a cucumber and tomatoes: I just felt like it. There was a song in my brain. I allowed myself a guilty pleasure. Don’t ask why it is on the grass – I was being artistic. The week has been a bit up and down. If I can remember through the brain fog (I couldn’t so I checked my calendar), it was Monday I went to the gym. Just, you know, to get in some exercise. I did well, I thought, considering. Twenty minutes on the treadmill (at what I considered a crawl), some leg extensions, leg press, bicep curls and chest press (arthritis needs muscle strength) and I used really light (to me) weights. However Tuesday I was a washout. TOTALLY! My physiotherapist shook her head at me sadly after I’d listed my activity the previous day. Prior to Christmas, not knowing how I would progress, I had reserved the option to take a further week of annual leave next week, over and above the time I have already been on leave. On Thursday I wasn’t feeling much improved, really, especially after my experience after the gym. I was worrying that even if I felt OK, once I starting DOING stuff, like going to work, I’d wash out again. Given the strong advice I had received from both my endocrinologist and Human Resources to take next week off as well, I made the decision and advised the appropriate people. By Saturday, I was feeling not too bad – had I made the wrong decision, I wondered to myself. Maybe I could go to work after all, even though the physiotherapist has booked me in for another session and a water therapy session next week. Then we had the second day of HEAT. If ex-Kiwis don’t like heat much, hyperthyroidodites (yes, I made up that word, I like it) like heat even less and forty degrees Celsius is just AWFUL. No, I thought to myself, you made the right decision, woman. Give yourself that extra week to feel really ready to re-enter the world. I’ve definitely slept better the last couple of nights. My digestive system had been behaving all week too. Until today. About lunchtime. There’s been a bit of pain, but it seems to have settled after the nth trip down the corridor to the “ladies room”. So yes, I made the right decision. I still struggle with the decision (thanks, Mum), but I know it was right. Have I spring (or summer) cleaned the house? No. Have I cleaned the oven? No. Is all the washing done? No. Have I vacuumed? Not bloody likely, mate. Have I ironed? What, are you completely crazy, or are you Tony Abbott? 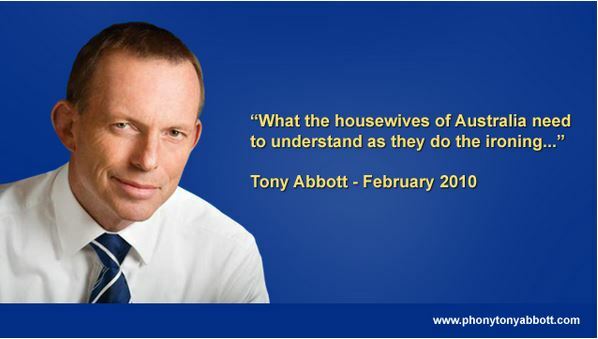 Note for overseas readers: our Prime Minister has a thing about women ironing. Do I feel guilty about all that? Not as guilty as I feel about taking an extra week of leave! I have set my phone to remind me when to take the medications because I forget if I have taken them or not. I think that’s getting better too though, thankfully. I read the medication actually suppresses the overproduction quite quickly, but the flushing out of the system of the already produced “stuff” takes a little longer. I can say I feel better, but I now need to use this coming week to work out my activity limits. The arthritis needs exercise, my mental health needs exercise, but I also need to rest. Working out how much physical exertion I can tolerate without paying for it the next day is what I have to do this coming week. I have decided having a chronic condition (or more than one as in my case) is a learning exercise. To anyone else just starting this journey, if you feel confused, anxious, frustrated, guilty …… you are not alone. The mental adjustment to being restricted is quite daunting at times. Don’t hesitate to seek support or ask for help if you need it. I know that can be damn difficult, especially for independent types, but we need to recognise we can’t compete in the Olympics any more. Not that I ever could or did, but we have to re-frame our expectations of ourselves. Careful with the exercise! With your thyroid gland overdoing it, you could get injured when you exercise (knees seem to be the weakest spots), that is, injury is more likely than it used to be. And if you do get injured, it could take forever to heal. So… Be careful. And yes, it does take time to get used to a chronic condition. It’s frustrating, it’s annoying, you want your brain back, you want your life back, you really don’t want to plan darn showers in advance so you actually have the energy to do it, there are good days, there are bad days… It definitely takes time. Now there speaks a fellow sufferer – or one who knows one! Yes, this is why the rheumatologist sent me off to the endocrinologist to tackle the thyroid first, so he can deal with what’s left. I am definitely starting to feel better. Today is better than yesterday and yesterday was better than the day before. In the mind: it is like a cloud has lifted. Yes, even finding the energy to shower can be a challenge some days. I wasn’t aware hyperthyroidism meant injury was more likely. I am so aware of trying to ensure I build back my muscle strength to deal with the RA and osteo. Hopefully this month’s round of blood tests will show we have the thyroid under control. If not, I guess the dosage gets increased. I know they like to treat with the lowest dose possible. My thyroid gland is under-active (Hashimoto), but sometimes, when the med dose is too high, I get some of the hyper symptoms. Like my heart beating in my throat (I wasn’t amused). Or knee pain (it’s actually muscles around the knees which hurt and which may get injured). Or sweating: now I sweat and can’t stand the heat even when the blood tests show the ideal level of the hormones (although, I was always better with the cold weather than with the high temperatures, so I’m not complaining about that one). I’m much better than I was. I train historical fencing twice a week (it’s great, both the body and the mind have to keep up, there’s no way of doing it automatically, and you always learn something new), and, when I look at what I accomplish, it’s not bad at all. It’s not what it was before the illness, but it’s not bad, either. I had sore knees yesterday and they had been not too bad for a while. Interesting to know it could all be tied in with the hormone levels. I am up for a round of blood tests again this month, so a this time I can only go on how I feel, I have no test results since I started the medication. I think your last sentence sums it up nicely. Not what it was before, but not bad either. I can see me getting to that place. Robyn, the thing that you are trying to learn at the moment is patience with yourself. As the body starts to age it is just so hard to not overdo it when for the best part of your life so far has been one of keeping the body as fit as you can. I have empathy for you, but you will work out just what you can do & what you can’t over time. You are sounding so much better, that is a good sign. Keep up the good work & get yourself a Webster pack from the Pharmacist to help you with yours meds, it takes the worry out of whether you have of have not taken them. Will catch up with you again soon my friend. Thanks, Sandra! Yes, patience has never been one of my virtues! Robyn, sorry to hear about your health problems. Sounds at least like the problems have been identified and you’re doing everything you can. I’m sure adjusting isn’t easy. Hope you get back to work and feeling better soon. Thank you. We think we have pretty much done with identifying now, but to be honest, there could be more. The waiting/testing/unknown phase is tough too. I just hope sharing may help others realise they are not alone in their challenge.